The differences between the towns of Christiania in the 18th century as opposed to the 17th century were hardly transformative. Growth and change was overall modest in scope. In the 17th century the population had hovered around 3,000 souls, by the end of the 18th century, it still struggled to surpass 10,000. However, a number of events and trends did mark one century off from the other. Two destructive events in particular shaped the city in the 18th century: The fire of 1686 and the Swedish invasion of 1716. It was hardly an auspicious start to the century. Yet, the 18th century laid the foundations for the capital status and the explosive growth, which was to take place in the 19th century. It established the timber barons, which would make Christiania a significant economic hub and a viable future choice as the nation’s capital. The fire in 1686 was important in several important respects. It laid waste to much of the upper city, where illegal timber construction had been a persistent problem. It also damaged the cathedral, which was subsequently demolished. However, the most crucial impact of the fire was that it precipitated the decision to give up the city’s outer defences and to reorient all defensive capabilities to the fortress. This resulted in two key implications. First of all, the city, now without walls, could expand. A new square and cathedral was established just outside the old city gate, on top of a natural lake that previously had served as a moat, but which now was to be filled in. A string of new houses began creeping out of the city towards the river Aker in the northeast, as if the city was seeking back to its old medieval roots across the bay. Indeed, the bay itself soon began to shrink. As harbour activity filled in the waters with sawdust, new land could be claimed and the harbour was eventually pushed three blocks east. It also meant, however, that the fortress would need more space in order to be defended effectively. City blocks that were too near could be used as cover by attacking armies and were demolished on that very basis. The old square, thereby, lost much of its original layout. It also lost, as previously noted, it’s church. The Swedish invasion of 1716 was repulsed, and though the Swedish king amassed new forces to finish the job, the second army never reached the city. However, damage from the invasion was magnified by the fact that the city had no outer defences. Consequently, the city was caught between the invading Swedes on one hand and defensive cannon fire from the fortress on the other. Much of the damage was, therefore, caused by friendly fire. The city hall, for instance, was reduced to a shell, and never held the function of city hall again. In terms of buildings, some differences can be noted in the style of the 18th as opposed to the preceding century. Half-timbered houses continued to be the most prevalent building-type, though the timber was often hid behind plaster. However, in brick buildings, the Dutch character of the 17th century fell out of favour and many stepped gables were altered to modern standards. The result was classical in inspiration, but the application of classical elements was modest and cautious. The town had no porticoes and hardly any pilasters. Oftentimes, the only distinguishing features of Christiania town houses were tall roofs and plain rows of sash windows. Some bay windows continued to be built and some survived from older times. The most ambitious town houses, however, relied on relatively simple features: ornamental doorways or plain triangular pediments. The city hall was moved to a house at the corner of what is now called Queen Street. Originally, the house faced the harbour, had stepped gables and, though it was built as a private residence, was crowned with an imposing tower. The building still has a courtyard front blocked off from the street by a screen. The tower may have been destroyed in 1716. In either case, the building as it now appears is roughly of the 18th century idiom. It is classical only in a symmetric streamlined sense, and the gables have been eliminated entirely. The other major public landmark, the new cathedral of 1697, is also relatively plain and the tower is a short stump compared to its predecessor. The interior, however, is said to have acquired a respectable baroque interior thanks to gifts bestowed by prominent citizens. The church is still the cathedral of Oslo, though it was altered extensively in the mid 19th century. Other examples of the new style, and generally the most interesting, are all private residences. Few of these, however, remain today. Still, a few exceptions can be found: The building that would later house the military academy was remodelled in 1761 and has survived on a corner on Queen Street. 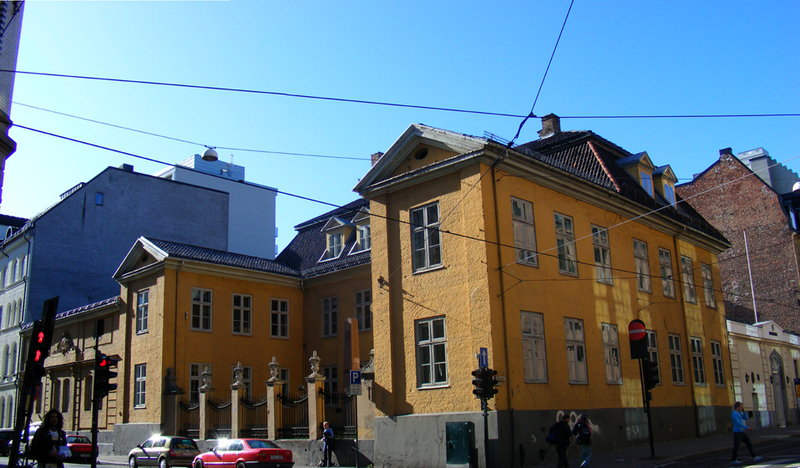 The building known as Treschowgården was built on reclaimed land in 1710. At the corner of the new square, on which the cathedral was built, stands a house from 1700. Several other buildings from the 17th century that bear 18th century alterations still exist also. Calmeyergården is a notable example. Colletgården, perhaps the most impressive of the baroque palais of the period was demolished in the 1930s, despite being listed for preservation. However, It was rebuilt in the Norwegian folk museum and can still be seen there today. Its main features are all centred: The doorframe capped by a segmental pediment, the quoin-like pilasters and the triangular pediment. The asymmetrical bay window of the secondary façade was left over from the previous design.